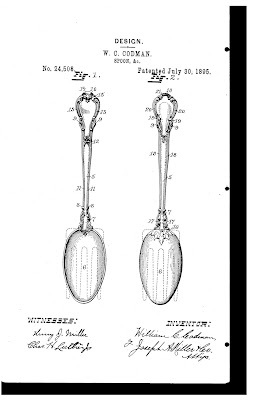 If you are a Gorham Chantilly history fan, you might be interested in seeing the original patent for this pattern. The U. S. Patent and Trademark Office has a searchable data base of patents. Unfortunately, it's difficult to search for patents issued before 1976 because they are in image format only. 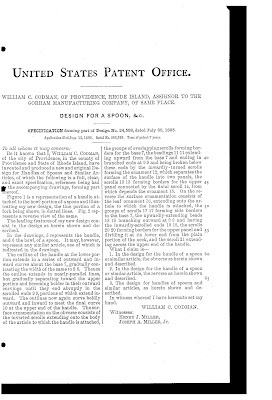 The two images below, found in that data base, represent the patent issued on July 30, 1895, to William C. Codman and Gorham for the Chantilly pattern. Click on an image to see a large version. Depending upon your image viewing software, you may be able to zoom in and out so you can see the documents better.